As Parents we have a strong desire to inspire, teach, and shape our kids. Whatever path they choose in life, we want them to be motivated by goodness and justice and compassion. We can preach to our kids all day long about the difference they can make for humanity. But daily, our kids, like us, are presented with choices between truth or lies, chivalry or self-centeredness, goodness or evil. The more they make the right choices, the stronger their conviction and character becomes. It’s scientifically proven that building good habits just takes practice. However, allowing our kids to see real life evidence, in history, of heroic goodness, justice, and compassion is like a giant boost in shaping the people they become. We live in a culture that loves when the good guy wins. Ant-Man, Frodo, Yoda, Ethan Hunt… They all show up in the nick of time and save the day. Our entertainment industry is built around that sweet feeling we get when good triumphs over evil. We pay good money for the happy ending. But that warm feeling we get with a fictional hero’s victory, does not change our character. When my kids defeat the bad guy on their iPad, they do not gain inspiration to Grow into defenders of justice. Yet more than anything I want them, and me, to be defenders of justice and goodness for all humanity. Traveling with kids all over the world presents opportunity to teach history we do NOT want to repeat. My kids have seen WWII memorial sites in Europe they will never forget. 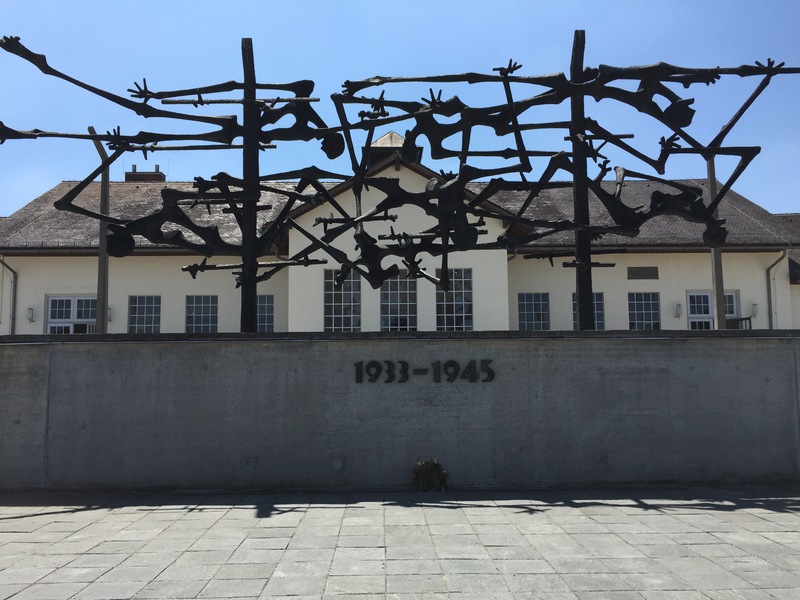 They have no doubts about the atrocities that occurred in concentration camps, like Dachau. They know about Japanese internment camps and have been exposed to our Country’s own mistakes. They stood inside holding cells at Fort Christiansvaern (on the island of Saint Croix), where African slaves were brought by ship from Africa and sold to local planters to work on Sugar plantations. Kids (and adults for that matter) must Learn the truth about humanity’s history. There is so much we do not want to repeat. With that in mind, do not miss the joy of humanity’s Victories! Anywhere you travel, there is evidence of good if you look for it. I will never forget standing with my family, outside the gates of Dochau. The grief you feels is unspeakable. But listening to one prisoner’s recorded testimony of the day the Americans stormed the camp and set them free? My family listened together with tears on our cheeks and goosebumps on our arms. Witnessing the site where true American heroes battled and saved lives causes children to Grow and be truly inspired. Our character cannot stay the same when it is challenged with such sacrifice. What about other real life heroes who will probably not have a statue built in their honor or any recognition in this world? The people with such strength of character they have chosen to give their lives for those in need? Can you imagine the impact it has on kids when they spend time serving along-side these heroes? When you go on a Servcation™ with your family, you will undoubtedly meet people who have devoted their lives to compassion and justice for the world. Rubbing shoulders with them even for a short time allows kids to learn about the needs and condition of our world, opens up endless conversations about justice, and gives opportunity for compassion to take root in their souls. So how do we inspire them to Grow into powerful, compassionate citizens of this world? Be intentional about exposing kids to real life heroes and victories for good.